“Kyun Armaan” ridhima asked sitting behind him keeping her hand on his shoulder. “Itna sab bol kar aaya tha mein sab ko kaise face karunga mein. Kis muh se mafi mangu mein sab se. Kya sch rahe honge sab mera bare mein” Armaan asked with tears. “Maaf toh tab kara jata hai na Armaan jab koi rukh jaye hum se aur aapne rutha nahi karte” she tried to make him see the clear picture. “hmmm” Armaan never said more than that. Ridhima smiled “so chale ghar” he just nodded his head in yes. 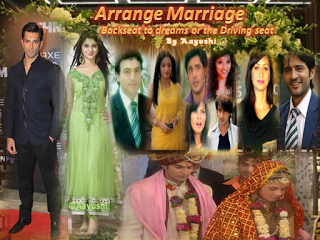 Soon they were in their way to home ridhima was driving the car Armaan was sitting lost. She look at his way in between only to smile as his lot face was looking too cute to resist. Ridhima parked the car reaching home. Armaan look towards home and took a deep breath ridhima just hold his hand walking by his side. Soon both of them were inside infront of nandani. Whose eye were closed initially Armaan tried to escape but then ridhima hold him back. “Armaan” she just called his name and he just exhale the breath he was holding since the time they get out of the car. Nandani too opened her eyes hearing the name of her son. “Armaan” she too mutter his name opening her eyes. Armaan look at her with tear in his eyes, nandani who was about to get up was hold back by Armaan who again made her lay back in resting position. “I am sorry maa” was all he could utter. “Maa se bhi koi maafi mangta hai” she said caressing her hair. Armaan just hugged her lying beside her, ridhima was standing near the leg post of the bed nandani looked at her smiling. Soon she opened her other arm towards ridhima indicating her to come in and join them. Ridhima instantly obliged. Nandani kissed both her kids. “Ab phir kabhi aisa nahi kehna” she said hugging them when Armaan utther “kabhi nahi” and cried. Soon keerti walked in holding soup for nandani, seeing Armaan ridhima there she was surprised initially but then her smile found the way to her face. All three of them look at the door ways hearing the voice of door clicking, seeing keerti standing there Armaan who was hugging his mother came to keerti hugging her she mutter a sorry to even her. “I am sorry bhabhi mein ne aap sab ko itna kuch bol diya ki” but he was cut in middle of his words. “Shhh… It’s okay bache ho jata hai kabhi kabhi hum jab ghussa hote hai toh humein khud ko nahi pata hota hum kya bol rahe hain, aur na hi hum un baton ko mean karte hai so it’s okay.” Keerti console Armaan. Since Armaan is younger and too cute when they meet him, keerti started calling him ‘Bache’ with love, considering him too innocent kid of the family. Ridhima too came and hug her sister. Soon Keerti move to feed Nandani her soup which she brought earlier when Armaan interrupt. All the three ladies look at him which got him shy saying what he wanted to say. “Hmm… Mein pila dun soup maa ko….” Armaan asked leaving wide smile on the face of ladies. Keerti without saying a word left the place she was sitting at handling the soup bowl to Armaan, she move around the bed to sit beside ridhima. Armaan start feeding soup to his mother who was lost in Armaan seeing his love for herself. Even shubhankar and Billy who came to ask nandani about how she was feeling were surprise to see Armaan ridhima taking to the ladies, laughing having fun. Armaan asked forgiveness from them too but even they just hugged him making him shut in his way of apologizing. After the family reunion where Armaan was like himself it took nandani a week to recover fully. Armaan ridhima took great care of her, I midst of all Armaan made shubhankar stay with them forever as his punishment for not letting him know what they suffered from. Shubhankar happily obelized to the sweetest punishment from his baby brother. Armaan ridhima took another week off from the social gatherings or gathering area to rejuvenate themselves properly before stepping out. And Things were getting back to normal slowly so shubhankar arrange a party for Armaan and ridhima as its there Anniversary around the corner. Every single friend of Armaan and ridhima were invited for the party and all the arrangements were done beautifully under keerti and nandani’s guidance. Armaan ridhima were not allowed to even move a figure for preparation help as they have to just rest and get ready for the function as a help. Soon it was a party night everyone was present there enjoying, having moktail (Sober Drinks) in their hands laughing chit chatting. When out of nowhere Rahul asked “Oye Tu abhi bhi gaata hai ki chod diya”. “Wahh.. kya baat kahi hai Rahul tum ne. Armaan aaj ek gaana ho jaye.” Said Anjali excitedly but Armaan denied. But they keep trying to peruse him but he didn’t bug when out of nowhere keerti came, she put a hand on his shoulder making him turn back to see who it is. Seeing keerti smiling Armaan knew he will no say no to lost battle only as from last 2-3 days keerti is making him do things taking name of yet-to-be born child of the family (Keerti was pregnant if you people remember). “Please” keerti said blinking her eyes before he can say no, seeing his mouth opening keerti said “baby ke liya” and there you go. LOST. Everyone started clapping hearing armaan sing appreciating him for his voice. Armaan was lost in ridhima moving looking at her face while she was trying to hide from him knowing his eyes are following her shy smile was playing on her face. Soon Armaan was lost in the dream sequence and same was with ridhima. Armaan was singing taking ridhima in his arms nuzzling on her face. While both of them were smiling. She open her eyes looking deep in his eyes, he wink at her making her shy. So to hide her shyness Ridhima put her hand on his eyes. Armaan kissed her forehead with love showing her he have all love and respect for her in the world. Ridhima came up to him sitting beside him she cares his hair making him smile getting lost in her, with bit of fun she dip her hand in pool and through some water drops on him laughing. Armaan puller her down from her head making all her laugh stop while blush settle in. they were Lost in each other when everyone clapped making them come out of their fantasy world. Realizing they both were imagining things they both blushed but Armaan being the in center while singing was noticed by all. Which was noticed by Shaurya who thought to pull his legs later. But even shaurya cunning smile was notice by Anjali “Sochna bhi mat” hearing voice shaurya turn around to see her smiling. Soon he realize what she said so he asked with frown “Kyun” winching. “Shaurya armaan have been through lot let him be happy” Anjali said leaving a heavy breath he just nodded getting her point of view. Armaan have always been strong for others but when he is considered with his own emotions he just mess himself walking into shell. His friends know about it so Anjali asked him not to mess around.